A MISTAKE AND HANDING OVER POSSESSION TO THEN CAPITALISE AS CLOSE TO THEIR GOAL AS POSSIBLE TO SCORE. KEY PRINCIPLE: TO WIN THE BALL BACK AS CLOSE TO THE OPPONENTS GOAL AS POSSIBLE. WHAT? ALLOWING OUR OPPOSITION TIME AND SPACE TO PLAY OUT FROM THE BACK. WHEN? WHEN THE OPPOSITIONS #3 OR #4 HAD THE BALL IN THEIR FIRST/DEFENSIVE THIRD PLAYED TO THEM BY THEIR KEEPER. WHY? THIS IS A PROBLEM BECAUSE IF AUSTRALIA CAN PLAY OUT EASILY THIS WILL ALLOW THEM THE OPPORTUNITY / TIME AND SPACE TO BUILD UP AND GO FORWARD. IN THIS SESSION I AIM TO IMPROVE MY TEAMS ABILITY IN EFFECTIVELY PRESSING OUR OPPOSITION INTO MAKING A MISTAKE AND HANDING OVER POSSESSION TO THEN CAPITALISE AS CLOSE TO THEIR GOAL AS POSSIBLE TO SCORE. CAN WE CREATE PRESSURE ON OUR OPPONENTS TO WIN THE BALL BACK ASAP WHILE MAINTAINING OUR SHAPE. 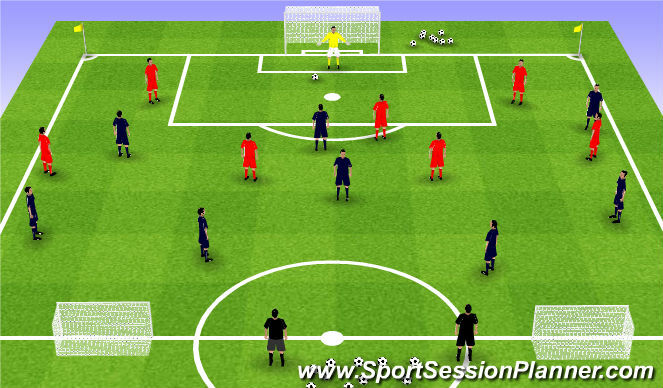 * 2 KEEPERS CAN JOIN IN OR WARM UP TOGETHER &apos;CHOSE TO LEAVE THEM OUT"
* PASSING SEQUENCE STARTS WITH A PASS TO THE LEFT MOVE TO THE RIGHT. 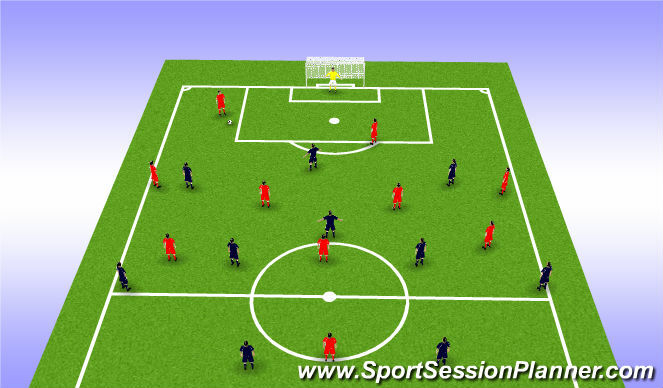 * PLAYERS WITH THE RED BIBS DIRECTLY OPPOSITE THE PERSON WITH THE BALL MUST PASSIVELY PRESS STRAIGHT ON AT FIRST ONCE THEY HAVE TAKEN THEIR TOUCH, THEN RETREAT TO THE CENTRE POLE. * REDS TO DETERMINE WHICH WAY TO SEND THE BLUES BY PRESSING ONE SIDE. * ALWAYS MAKE SURE WE HAVE ADIQUETE NUMBERS ON EACH CONE. * REGULAR ROTATION OF THE CENTRE PLAYERS. * BEGIN SLOW AT FIRTS AND STEADILY INCREASE THE TEMPO. * 3 PRESSING DEFENDER ONLY INSIDE THE GRIDS ALLOWED. * IF THE 3 PRESSING DEFENDERS WIN POSSESSION AND PASS TO EACH OTHER 4 PASSES THEY WIN 1 POINT. * IF THE PLAYER STARTING WITH THE BALL CAN GET IT TO END ZONE PLAYER AND BACK AGAIN THEY ARE AWARDER 1 POINT. * MUST PE PLAYED AT BY ALL PLAYERS FOR A POINT. *CAN WE CREATE PRESSURE ON OUR OPPONENTS TO WIN THE BALL BACK ASAP WHILE MAINTAINING OUR SHAPE. * CAN THE CLOSEST DEFENDER IMMEDIATELY APPLY PRESSURE ON THE BALL CARRIER & FORCE WIDE? * CAN YOU FORCE THE DIRECTION OF THE PASS INTO A 1 V 1 SITUATION? * CAN THE TEAM ADJUST (STRONG SIDE / WEAK SIDE) & HOLD DEFENSIVE SHAPE? 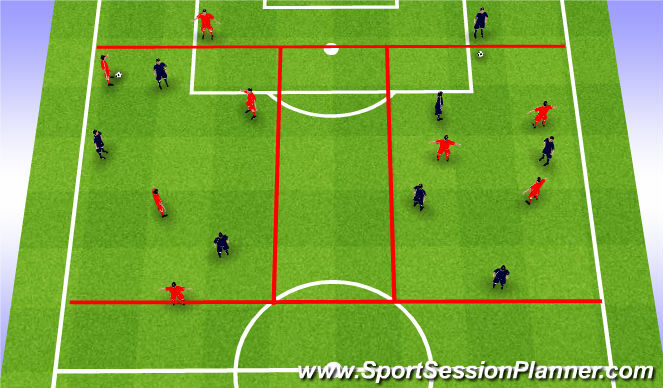 * CAN YOU POSITION YOURSELF DIAGONALLY BEHIND THE CLOSEST DEFENDER TO BLOCK FORWARD PASSING? * CAN YOU MAKE A DIAGONAL RECOVERY RUN TO BLOCK FORWARD PASSING LANE TO OUR OPPOSITIONS #8/11? * CAN YOU CLOSE THE SPACE & FORCE OUR OPPOSITIONS #3/4 WIDE INTO 1 V 1 WITH BPO #7/11? * CAN YOU BLOCK THE FORWARD PASSING LANE TO OPPOSITIONS #7/11 & MAINTAIN PROXIMITY GOAL SIDE TO THE OPPOSITIONS #6/8? * CAN YOU POSITION YOURSELF DIAGONALLY BEHIND OPPOSITIONS #6/8 & BLOCK FORWARD PASSING LANES TO THEIR #7/11? * CAN YOU BE IN A POSITION TO ANTICIPATE & INTERCEPT A FORWARD PASS TO OUR OPPOSITIONS #6/8? * #7/11 CAN YOU BLOCK THE FORWARD PASSING LANE TO BP #7/11 & MAINTAIN PROXIMITY GOAL SIDE TO OUR OPPOSITIONS #2/5? * CAN YOU POSITION YOURSELF TO PREVENT THEIR #2/5 RECEIVING THEIR 1ST TOUCH BEYOND YOU? * CAN YOU BE IN A POSITION TO ANTICIPATE & INTERCEPT THE FORWARD PASS TO OUR OPPOSITIONS #2/5? * CAN YOU POSITION YOURSELF DIAGONALLY & BE ABLE TO IMMEDIATELY CLOSE DOWN & PRESS THEIR #2/5? * AS OUR OPPOSITIONS #3/4 IS TRAVELLING CAN YOU RECOVER DIAGONALLY & BLOCK FORWARD CENTRAL PASSING LANES? * IF OUR #10 IS DRAGGED OUT OF MIDDLE CAN YOU ADJUST, COVER THEIR POSITION & SCREEN OUR OPPOSITIONS #7/11? 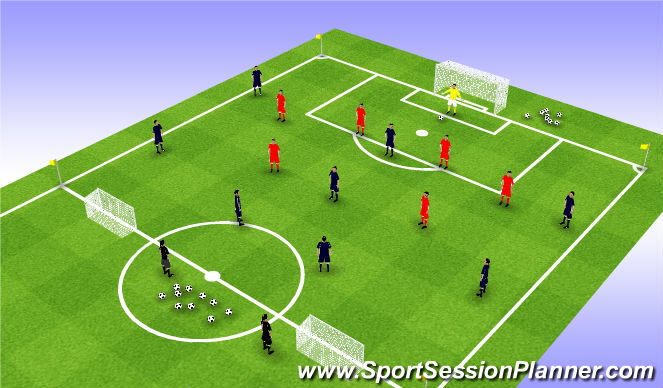 * AS OUR #3/4 TAKE SPACE CAN YOU STEP-UP TO PRESS THE BALL & FORCE WIDE TO OUR OPPOSITIONS #2/5? * IF A PASS HITS OUR OPPOSITIONS #6/8 CAN YOU IMMEDIATELY ADJUST & SUPPORT OUR #10? * AS OUR OPPOSITIONS #3/4 IS TAKING SPACE CAN YOU BLOCK THE FORWARD PASSING LANE TO THEIR #7/11? * AS THE BALL TRAVELS TO OUR OPPOSITIONS #2/5 CAN YOU ADJUST TO BLOCK CENTRAL PASSING LANE & ALSO BE ABLE TO SUPPORT OUR #7/11 CENTRALLY? * AS THEIR #3/4 IS TRAVELLING CAN YOU POSITION YOURSELF DIAGONALLY INSIDE OF THIE #2/5 & ENSURE THAT THEY CANNOT RECEIVE THEIR 1ST TOUCH BEYOND YOU? * AS THE BALL IS BEING PLAYED TO THE OPPOSITIONS #2/5 CAN YOU POSITION TO ANTICIPATE & INTERCEPT THE PASS? * IF A CENTRAL PASS IS MADE TO THE OPPOSITIONS #6/8 CAN YOU ADJUST & IMMEDIATELY PRESS FROM THE OUTSIDE WHILST BLOCKING THE PASSING LANE TO AN OVERLAPPING OUR #2/5? * RED TEAM MUST TRY TO SCORE IN THE 2 SMALL GOALS. * BLUE TEAM MUST PRESS TO WIN THE BALL AND THEN SCORE AS QUICK AS POSSIBLE, "10 SECONDS FROM WINNING THE BALL"
CAN WE EFFECTIVELY PRESS ON OUR OPPONENTS TO WIN THE BALL BACK ASAP AND AS CLOSE TOP THEIR GOAL AS POSSIBLE. * CAN WE PREVENT THE OPPOSITION FROM PLAYING OUT AND GOING FORWARD. * CAN OUR #9 SPLIT THEIR KEEPER AND THEIR #3 OR #4 DEPENDING WHICH SIDE, TO CLOSE OFF THE PASS BACK OPTION. * CAN WE ISOLATE ONE OF THEIR PLAYERS BY CREATING A 2 V 1TO WIN THE BALL. * IS OUR #7 & #11 CLOSING IN ON THE OPPOSITIONS TO THEIR #2 & #5 TO PUT AS MUCH PRESSURE ON THE BALL CARRIER. 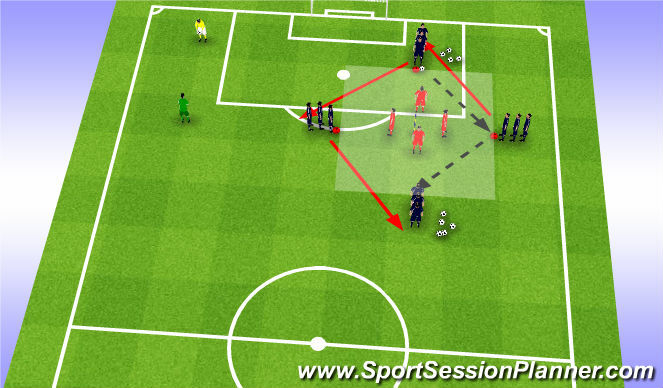 * AS OUR OPPOSITIONS #3/4 IS TAKING SPACE CAN YOU BLOCK THE FORWARD PASSING LANE TO BP #7/11? * AS BP #3/4 IS TRAVELLING CAN YOU POSITION YOURSELF DIAGONALLY INSIDE OF BP #2/5 & ENSURE THAT THEY CANNOT RECEIVE THEIR 1ST TOUCH BEYOND YOU? * COACHING ON THE RUN TO REMIND THEM OF THE SESSION OBJECTIVE. AFTER THIS TRAINING SESSION OUR #6, #7, #8, #9, #10 AND #11 SHOULD BE ABLE TO EFFECTIVELY PRESS THE BALL CARRIER IN NUMBERS TO FORCE THE MISTAKE. THEIR DECISION MAKING AND MOVEMENT OFF THE BALL WILL BE SHARPER, AND THIS WILL HELP TO CONVERT SCORING CHANCES. WAS THE SESSION OBJECTIVE ACHIEVED? WAS THE FOOTBALL PROBLEM SOLVED?